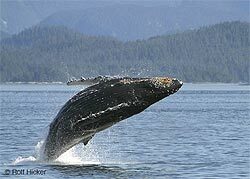 Description: Humpbacks are well known for breaching, and their complex songs. The name humpback whale describes the motion it makes as it arches its back out of the water in preparation for a dive. Humpback Whales can be easily identified by their obvious humps and black upper parts. The head and lower jaw are covered with small, round bumps on the front of the head called knobs or tubercles, and are characteristic of the species. The pectoral fins, which are up to one-third of a Humpback Whale body length, have rough edges are the largest flippers of any whale. They breathe air at the surface of the water through 2 blowholes located near the top of the head. Their blow is a double stream of spray that rises 3.1-4 m above the surface of the water and the flukes can measure up to 3.7 m wide. An adult usually ranges between 12-16 m long and weighs approximately 36 tonnes. Ecology: The female Humpback Whale typically breed every two or three years. The gestation period is eleven months. A Humpback Whale calf is about 4–- 4.5 metres long when born and weighs approximately 700 kg. Calves are nursed by their mothers for their first six months, then are sustained through a mixture of nursing and independent feeding for a further six months. Calves leave their mothers at the start of their second year, when they are typically 9 metres long. Both males and females reach sexual maturity around the age of five. A Humpback Whale can live for 45–- 50 years. 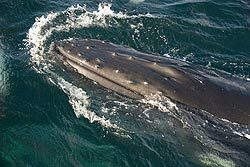 Interesting facts: Humpback whales are seasonal feeders and carnivores that filter feed tiny crustaceans (krill), plankton, and small fish including herring, mackerel, capelin, and sandeel from the water. An average-sized humpback whale will eat 2,000-2,500 kg of plankton, krill and small schooling fish each day during the feeding season of about 120 days in cold waters. They eat twice a day. Status: Consequences of global warming for this and other whale species are not well documented however there are direct links in the food chain that increase humpback whales vulnerability if krill and other plankton species are effected by the predicted changes in ocean ph.There is some evidence that ocean acidification from fossil fuel CO2 invasion and reduced ventilation will result in significant decreases in the ocean sound absorption for frequencies lower than about 10 kHz. Under reasonable projections of future fossil fuel CO2 emissions and other sources a pH change of 0.3 units or more can be anticipated by mid-century. Ambient noise levels in the ocean are set to increase significantly. This increase in acidity, could decrease noise absorption by almost 40 percent, and sound could travel up to 70 percent farther. This will have unknown ramifications for the role sonar plays in the humpbacks capacity to hunt and ultimately survive in open oceans. synchronised under water ballet, provides them with all the krill they need. From the BBC.